"Your Pet's Comfort is My Passion"
Pawtails Pet Sitting is a member of the Better Business Bureau. It's mission is to advance marketplace integrity through business self-regulation, assist in resolving disputes, and correct abuses to serve the best interests of the consuming public and business. 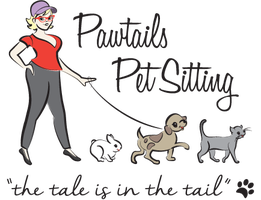 Pawtails Pet Sitting is a member of the National Association of Professional Pet Sitters' (NAPPS). It's mission is to provide tools to foster the success of members' business, to promote the value of pet sitting to the public and advocate the welfare of animals. I've completed an eight hour training course in emergency skills for pet CPR, bleeding & shock management, vitals assessment, first aid kit prep, insect & snake bites, heat & cold injuries, along with many others to ensure your pet's ultimate safety while under my care. Business Insurers of the Carolinas offers the broadest coverage in the industry for the pets and property in my care. Whether in my client's home, in transit, or at my home, every pet in my care, is covered under this association's plan.